Bluetooth technology is wonderful, and could even be a life saver. Bluetooth, as most of you know by now, is a wireless standard designed so that electronic devices can "talk" with each other. It's only good for short distances, apparently conceived of originally as a way to replace the RS232 cables that link computers and peripherals, but it has become much more than that. The short distances over which it works means it may not be any good as, for example, a cell phone, but it's ideal for linking devices to cell phones, bringing a new generation of hands free freedom in an age when lawmakers are either contemplating or implementing bans of cell phone use in moving vehicles. It's the cell phone interfacing that I find really interesting, especially since increasing numbers of carmakers include it – often with voice control. And since more and more cell phones include Bluetooth, it's a marriage made in safety and convenience heaven. But what if your car doesn't have Bluetooth built in? It seems discriminatory to exclude millions of people who have Bluetooth phones but whose cars refuse to pair up with them. Let's pass a law! Let's not. There's an abundance of Bluetooth-equipped devices that can communicate with such phones, cutting out the "middle man" (the car), which also means that, depending on the Bluetooth device, you can take that convenience with you away from your wheels. Some of these gadgets are handy little earpieces, including a pair of BlueAnt Wireless's devices I've been messing about with, while others can clip onto your vehicle's sun visor, a pair of which (also from BlueAnt Wireless) I've been messing about with as well. Any excuse to drive cars…. The Bluetooth gadgets included two types of headsets and two varieties of speakerphones their people said are "representative of the variety of choice within the most popular use cases for complying with hands-free laws". Whatever happened to "hands free" meaning you were free of a nosy government's greedy hands? The Q1 headset and Supertooth 3 "speakerphone" (the sun visor-mounted thingy) are voice-enabled and have a pretty good set of bells and whistles for such devices, while the lower end Z9i headset and S1 speakerphone thingy are aimed more at the budget conscious or techno-fraidy. Once I'd managed to get the stuff out of its horrible packaging, I divvied it up between four of us, and then we swapped them around a bit. We came away with the impression that these are good products that work as advertised, and isn't that how it's supposed to be? Nothing is perfect, of course, which is a good thing or this column would end now. 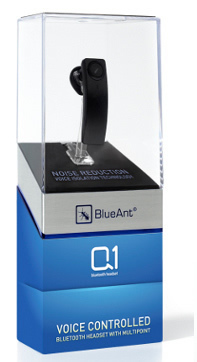 The $150 Q1, says BlueAnt, is one of the only voice-controlled headsets on the market right now, though that's sure to change if they catch on. The great thing about voice control is that you don't have to reach up to year ear, sun visor or LCD screen and poke at what could be tiny and difficult to find buttons, which helps make for a truly hands-free a driving experience. The painful thing about voice control is the training, and the misrecognized words, numbers and phrases (though that can be unintentionally hilarious at times), and the technology's difficulty in understanding accents. Such interfaces are often slower to use than a straightforward touch screen or, shudder, mouse-like cursor control device, too, especially since they sometimes require you to go through extra, "confirmation of the command", steps. This isn't a knock on the BlueAnt stuff; it's the nature of the technology right now. The Q1 also sports "Voice Isolation Technology" for, according to BlueAnt, outstanding call quality. It's equipped with multipoint technology as well, for pairing two phones – a nice bit of convenience. The unit's very small and quite comfortable in the ear, though I heard one complaint that it wasn't very adjustable. Its fit left a bit to be desired, too; we thought it a tad loose and it tended to flop around when the wearer moved his head. That's not a deal breaker, though. The voice interface works very well. It starts right off the bat by telling you how to pair it to your phone, walking you through the process – though the instructions are a bit vague because, I assume, they're designed not to be phone specific. Still, once you get up and running the process is easy to follow. Sound quality is very good, and the unit does a good job of minimizing background noise. The sound quality is good at the "receive" end as well. I spent most of my time alternating between the Z9i headset and the S1 speakerphone. The $110 Z9i is more low end than the Q1 headset, and basically omits the voice recognition. It's comfortable in the ear, though I also found it a bit loose until I discovered I could keep it in place by using a nail gun. Sound quality is fine as well, and the noise suppression and noise reduction work as they should. I had been using a competitor's headset for a couple of years, a model with which I was very satisfied, but I think I'll stay with the BluAnt going forward. I think its sound quality is a bit better and my gripe about it being loose was pretty minor. The speakerphone I used the most was the $100 S1. It's also the lower end of the two (what a saint I must be to share the high end stuff! ), but it also works well. The S1 is very easy to operate, to pair, and to live with, and the sound quality is fine, though I thought both of the speakerphone models were more prone to outside noise than the headsets, especially when they were being used in convertibles with their tops down (well, duh!). Both speakerphones also get BlueAnt's multipoint and noise cancellation technology – and they'll even output in stereo and let you stream music to them. This sounds better than it actually, well, sounds, though, because the tiny speakers are definitely not audiophile grade. Still, it's hard to complain about a company piling on extra features. The $150 Supertooth 3 is the higher end speakerphone, and gives more voice control. It also uses text-to-speech technology to announce callers' names from your address book if you download it. As expected, the audio quality is fine, and BluAnt says this model even adjusts sound levels to help make up for engine or external noise. Maybe so, but it still suffers when there's lots of ambient wind and/or noise. This shouldn't come as a surprise, though. To mount the speakerphones, all you have to do is clip them to the sun visor – there's no other installation. And if you want to take it with you when you leave the car – probably a wise thing to do if you don't want to attract the criminal element – you can simply disconnect the magnetic clip from the body of the unit, leaving the clip on the visor. The units take up quite a bit of sun visor space – which was particularly noticeable in cars with tiny little visors such as the Porsche Cayman S. And they wouldn't work at all on my old Infiniti Q45, whose visors fold right up into the roof and snap into place, leaving no room for the clip. But those are exceptions; the units worked fine in several different vehicles. One reviewer pined for an extra "pair" button on the Supertooth 3 so he wouldn't have to remember a mystery combination of keys to press, which required a trip to the manual. The Supertooth 3 also streams music, but like its baby brother the speaker quality means it's really suitable only for listening to Rush Limbaugh or Mark Levin podcasts. Perhaps BlueAnt would consider building an FM transmitter into the next model so the Supertooth can act as a conduit, transmitting the stream with reasonable fidelity from the device to the car's tuner. We had no complaints about the battery life of any of the units; they're better than the phones with which we used them. Bluetooth is definitely the way to go if you have a cell phone and a vehicle these days, and any of these BlueAnt devices can do the job. Which one's best for you depends on how you'll use it and, of course, your budget and tolerance for voice control. My favorite was the easy-to-use Z9i headset, which gives you more flexibility of movement than the visor-mounted speakerphones. But that's just me.